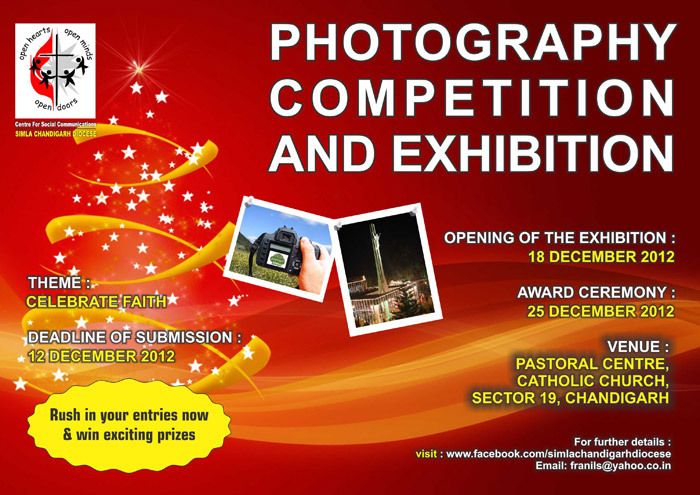 Last date for submission of entries will be 12th December 2012. Entries have to be given in printed form along with a digital copy on a CD. Size of the printed picture should be 8X12 in matte. The printed photograph should be of the above specified size. Failure to do so shall result in disqualification. The digital copy of the photographs should be given on a CD. Photographs and CDs should have the name, class, school and phone number of the participant. Kindly write on the reverse of the photograph. Submitting photographs taken from the internet will result in instant disqualification. Only basic editing like cropping, adjustment of brightness, contrast and colour balance is allowed. Submitted photos will be the property of Simla Chandigarh Diocese and will not be returned to the participants. The images will be reproduced with due credit to the photographers. The winning participants will be felicitated on 25th December, 2012. Rev. Fr. Joe Kalathil SJ, the Director of Commission for Religious Harmony is organizing a Seminar on Female Foeticide DPC, Chandigarh to observe the Girl Child Day. Please observe 08th September 2012 (The Nativity of the Blessed Virgin Mary) as the Day of the Girl Child. On every second Saturday of the month in the Christ the King Cathedral, sector 19-A, Chandigarh, the Night Vigil is conducted by the commission for Evangelization and Proclamation in collaboration with the sisters of CSSH. Faithful are invited to come and experience the Lord. The Vigil begins at 9.00 p.m. and concludes with the Holy Eucharist at 5.30 a.m.
23rd Sept. - Annual Clergy Retreat. It will begin on 23rd Sep 2012, Sunday- (after Supper) and end on 28th Sep (Friday) with dinner, at St. Edward’s, Simla. Fr. Tomy SAC from Cenacle Ashram, Bilaspur will guide us. There will be no Mass in the Convents during the days of the Priests Retreat. Please keep us in your prayers. 7th August 2012 Clergy Recollection & Vianney Day. The directors of the various diocesan commissions will meet on 7th August at 10.30 a.m. The recollection begins at 7.00 p.m. followed by Vianney day celebrations on 8th August. Seminar on Marriage & Pastoral Concerns for all the Priests of the Diocese, at DPC, Chandigarh. Resource Person: Rev. Fr. Dominic Savio Fernandes, Mumbai. The seminar begins at 10.30 a.m.
02nd July 2012 Inaugural mass at Kristu Jyoti Gurukul, Kauli. 05th July 2012 Laying of Foundation Stone at St. Joseph’s Convent School, Bathinda. 06th July 2012 Blessing and Inauguration of Karunalaya, Bethany, Karnal. 12th July 2012 Inaugural Mass at St. Joseph’s Diocesan Minor Seminary, Kauli. The monthly recollection will begin 7.00 p.m. at the Diocesan Pastoral Centre, Chandigarh. Priestly Ordination of Deacon Kishor Toppo at Chhipadohar, Jharkhand. (Daltonganj Diocese) at 7.30 a.m.
A three day camp will be organized for the children from 28th May to 30th May at Holy Family School, Nabha Sahib. Mass of the Lord’s Supper at Christ the King Cathedral, Sec 19 -A, Chandigarh at 6.00 p.m.
Celebration of the Lord’s Passion at Christ the King Cathedral, Sec 19 -A, Chandigarh at 3.00 p.m.
Celebration of the Holy Eucharist at Christ the King Cathedral, Sec 19 -A, Chandigarh at 11.00 p.m. The meeting will be held in Bishop’s House, Chandigarh at 10.30 a.m. The Bishop will bless the hostel at Amloh at 6.30 p.m. The Bishop will meet the Youth Director: Fr. A. Dexen and his team at 4.30 p.m.
All the commissions will meet in the Bishop’s House, Chandigarh at 2.30 p.m.
Bro. Rhymon Henry will be ordained Deacon at St. Joseph’s Church, Kalka, Haryana. The Holy Eucharist will begin at 5.30 p.m.
Fr. Kejus will celebrate the silver jubilee of his priestly ordination at St. Thomas Church, Rajpura. Holy Eucharist at 5.30 p.m.
Fr. George will celebrate the silver jubilee of his priestly ordination at Little Flower Church, Panckula. Holy Eucharist at 5.30 p.m.
03, March DIOCESAN PASTORAL COUNCIL MEETING, DPC, Chandigarh at 10.30 a.m.
17&18, March REGIONAL CATHOLIC COUNCIL (RCC) Meeting, DPC, Chandigarh at 10.00 a.m.
19, March SEMINARY DAY, St. Joseph’s Diocesan Minor Seminary, Kauli at 6.30 p.m.
20, March TRAINING PROGRAMME FOR CATECHISTS of the Diocese, DPC, Chandigarh. 24, March DIOCESAN/RELIGIOUS SCHOOLS - Board Meeting, DPC, Chandigarh at 11.00 a.m.
27, March FINANCE COMMITTEE MEETING/BUDGETS, Bishop’s House, Chandigarh at 10.00 a.m.
28, March SEMINAR ON CELIBACY -led by Fr. Kejus & Fr. Dominic at DPC, Chandigarh at 10.30 a.m.
29, March CLERGY RECOLLECTION - by Fr. Cyriac Kochalumkal CST (Faridkot) at 10.00 a.m.
CHRISM MASS, Christ the King Cathedral Church, Chandigarh at 5.30 p.m.
Come and renew. Go and proclaim! The clergy recollection for the month of February is on 7th and 8th of February at Christ the King Cathedral, Chandigarh. A chapel will be blessed in Jhudan on 16th February at 11 a.m. The clergy commission and the commission for vocations along with the director and the commission members will meet in Chandigarh on 25th February at 10.30 a.m. The commission for Evangelization and Proclamation along with the director and the commission members will meet in Chandigarh on 27th February, 2012 at 2.30 p.m.